Jimmy Connors' book made me cry. Nothing to do with this tennis career, everything to do with his beloved dogs. Now, Mr. Connors has long been one of my all-time favorite tennis players, and I've seen him in action on more than a few occasions. I loved his antics and his talent, and reading about his life was incredibly interesting. I couldn't put his book down. He's eloquent, descriptive, and you really get a feel for his sense of humor, which sadly, many missed. Backed by a loving and loyal mother, Gloria, young Jimmy was shaped to become the champion he became. She taught him well; not only physically but also mentally. He talks about his mother, his grandmother, his father and grandfather and his brother Johnny. 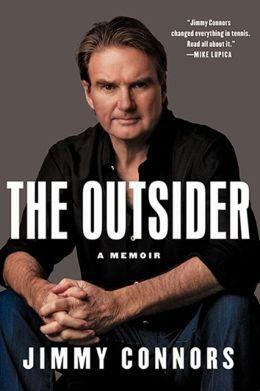 We knew Jimmy Connors was different, but who knew the real Jimmy Connors? It was eye-opening to read about his OCD and his gambling stints. His lovely wife Patti proved to be the love of his life, and still is. (I put my thumb to my nose to all those critics back in the day!) I found it amazing how he recalled his matches in so much detail, many of which I witnessed on TV. He talks animatedly about the many matches he won and/or lost, the pressure, his incredible opponents, his travels, his temper, his time with Chris Evert (not nearly as bad as some people are making out—in fact, I thought he was rather respectful), his close friends, and of course, his beloved immediate family. Jimmy Connors' game lasted way longer than any other player. He had the idea to start the seniors tour, and although I've seen them on TV, I'd give anything to see them now! Jimmy tells his story with humor, candid authority, with love and respect, and a healthy dose of charm. I feel as though I now truly understand this very misunderstood athlete and superstar. Conclusion - This book was an absolute pleasure to read and I highly recommend it to any serious tennis fan.